Mercedes in the pressure cooker? Often described as a ‘diva’ by Toto Wolff and given their performance through FP1 and 2, it would be easy to write off the team's issues in Malaysia as a novelty, centered around the W08’s much hyped wheelbase and demonstrably different aerodynamic philosophy combined with a car not suited or dialed into the prevailing circuit characteristics. The problem with that is that many expected Malaysia to be an altogether happier hunting ground for the Silver Arrows, as having been on the backfoot in Singapore the W08 should be much more accomplished around the Sepang International Circuit, as it’s more in their aero and chassis wheelhouse. It’s easy to make those hypothetical statements but we must remember that not all things are equal in Formula One, in fact we’ve already alluded to the different chassis and aero philosophies in play and how small changes in climatic or setup conditions can tilt performance toward one team. Furthermore, the teams and drivers will almost always take the lower pressures available to them, as with all things being equal it should improve performance for the entire field. The larger pressure delta between the front and rear tyre is going to have an affect on the car's handling characteristics, especially in transient conditions and is something that is exacerbated by this circuits mix of low, mid and high speed corners. Whereas a circuit like Silverstone is tilted more toward mid to high speed corners, meaning the aerodynamic balance can be shifted to suit. The change seems to have hurt Mercedes more than anyone else in this respect owing to their long wheelbase, finite detail aerodynamic philosophy as it changes the behaviour of the tyre platform, the cars pitch sensitivity and the wake profile of the tyre - all of which can be detrimental to aerodynamic and mechnical performance, if you're unable to counter through setup change, something that is perhaps more difficult on the W08 as many expect it to have a narrower operating window. This also draws us into another of the setup elements that Pirelli now have control over - camber, which allows the teams more scope to work around issues, seems to have been granted a wider operating window for Malaysia (relatively speaking) and perhaps handed a little more performance to their rivals. 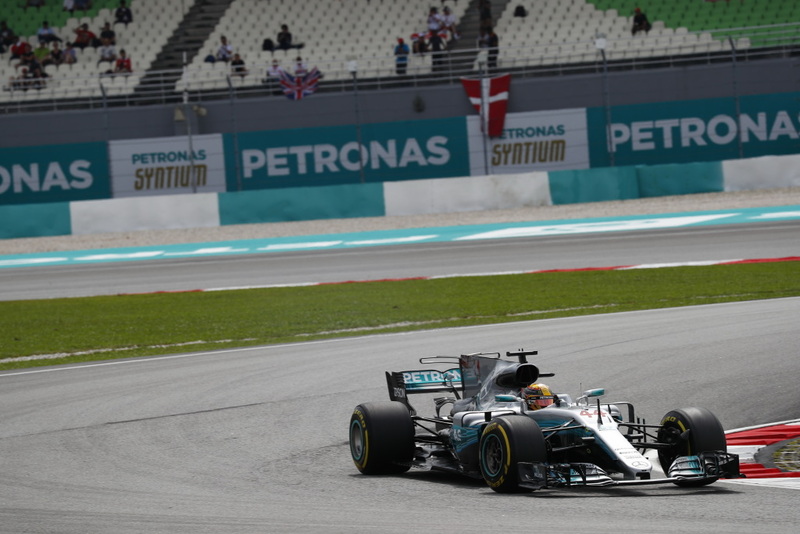 On top of their tyre dilemma Mercedes arrived at the Sepang International Circuit with a raft of new parts to trial on the W08, as they look to maintain their gap to Ferrari, who are also pushing hard on the development front. 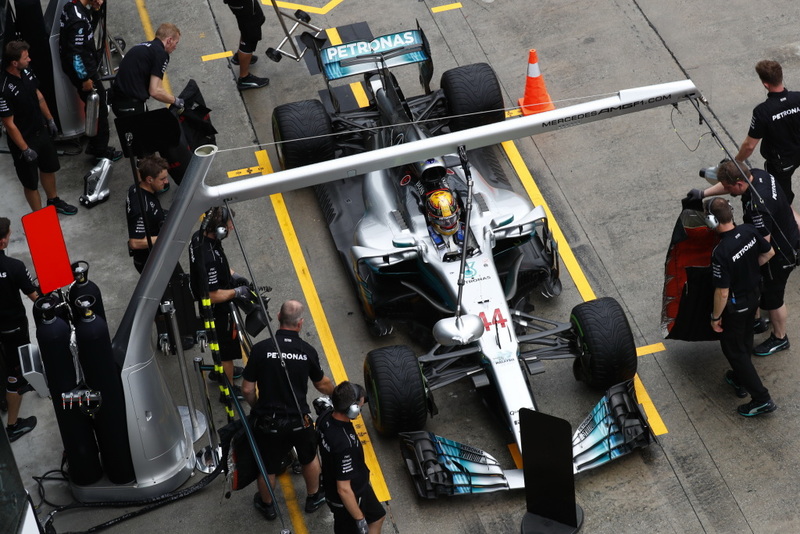 The W08 was furnished with a revised front wing, nose ‘cape’, bargeboards, floor and diffuser in Free Practice 1 & 2. However, with both drivers struggling relative to the Ferrari and Red Bull’s around them they decided to do some back-to-back assessment with their old aero configuration in FP3. Feeling more comfortable with the old package Hamilton decided to revert to the old parts, whilst Bottas soldiered on. Whether the Finn felt more comfortable with that spec or whether it was simply that the team wanted to gather more information for forthcoming races isn’t yet known. The introduction of these new parts, which undoubtedly come with an aerodynamic balance shift, on top of the tyre pressure delta obviously threw the team into a disarray initially but what is impressive is their reaction to this, able to find a workaround that brought them into contention in short order. It's not over yet though, as although they may have made the best of a bad situation in qualifying it’s yet to be seen if they have fully mastered these issues, meaning they may resurface on Sunday and have an affect on their race pace, unless the rain clouds start to ciculate of course, then the whole debate is moot. Have Pirelli made changes since? It is not unheard of that a change may be made Pirelli overnight, in order to 'balance the books', with data collated during Friday's sessions leading to a pressure change on the Saturday. I have asked Pirelli to confirm this one way or the other but at the time of writing they have neither confirmed or denied a change was made. Of course any changes will have a bearing on performance and setup for everyone and can lead to a closing up of the pack, so this information is crucial in understanding how well Mercedes have done in closing down their previous deficit.